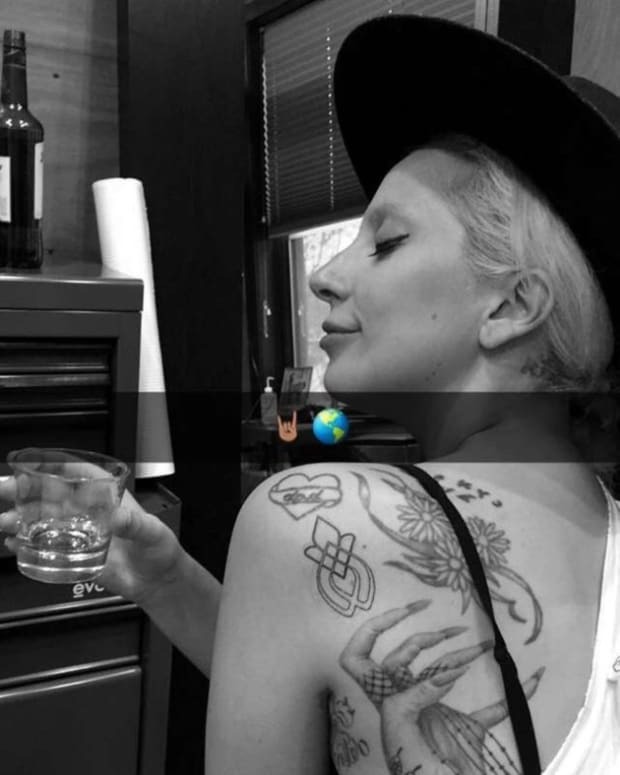 Lady Gaga is known for many things, but her rapidly growing collection of tattoos is one of her most identifiable characteristics, and the pop star is beyond proud of the ink, which she mostly keeps on the left side of her body, per a promise she made her father to keep her right side (for the most part) tattoo-free. On numerous occasions though, Gaga has, with the help of a professional makeup artist or two, covered up her ink, at the Golden Globe Awards in January, and again earlier this month, while meeting the royal family in London. For the 2016 Golden Globe Awards, Lady Gaga reportedly teamed up with makeup artist extraordinaire Mike Mekash, who worked with the singer on American Horror Story: Hotel, to cover up her extensive ink. Mekash used acrylic and adhesive based makeup to achieve the tattoo-free look at the Golden Globes, and Lady Gaga must have liked the end result, because she covered up her tattoos again to perform at the Royal Variety Performance for Prince Charles and Camilla, Duchess of Cornwall, earlier this month. Gaga paired her ink-free look with a stunning pink silk Brandon Maxwell halter dress and an elegant up-do. Gaga’s ultra-conservative outfit at the Royal Variety Performance this year was definitely a different look for the 30-year-old, but what really got heads turning was the absence of her tattoos. 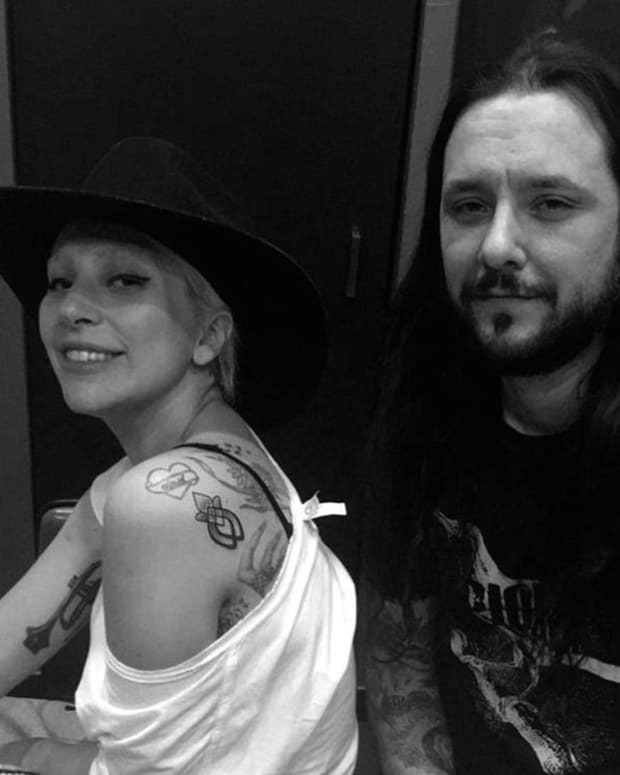 To date, the singer has 20 pieces of permanent ink, her latest being a matching tattoo she got with her dad of her aunt’s name, “Joanne,” which also happens to be the title of her latest album. She also recently got a symbol of unity inked on her left shoulder as a tribute to the survivors of sexual assault she performed with onstage at the 88th Academy Awards this past February. It was only recently that Lady Gaga started covering up her ink for awards shows and other prestigious events. Last year, her tattoos were on full display for the Emmys, and while she looked flawless as ever in an elegant, one-shoulder black Brandon Maxwell gown, her recent tattoo cover-ups have shown us another side of the pop star, and we don’t hate it. Gaga’s tattoo-free look is totally unexpected, and, compared to the daring, edgy (and sometimes just downright odd) fashion choices she typically makes, it&apos;s ultra-feminine and glam as well.